► What is synfuel and why should we care? ► Could it provide a breakthrough for cars? Synfuel might sound like the polluting stuff already being burnt in cars, but it’s actually the opposite: a saintly new invention that is carbon neutral and cheap, and may save the internal combustion engine from extinction. Produced by extracting CO2 from the atmosphere in a process known as ‘direct air capture’ and combining it with hydrogen produced by renewable energy, synthetic fuel (synfuel for short) can be used as a blend with conventional fossil fuels or as a complete substitute in internal combustion engines. 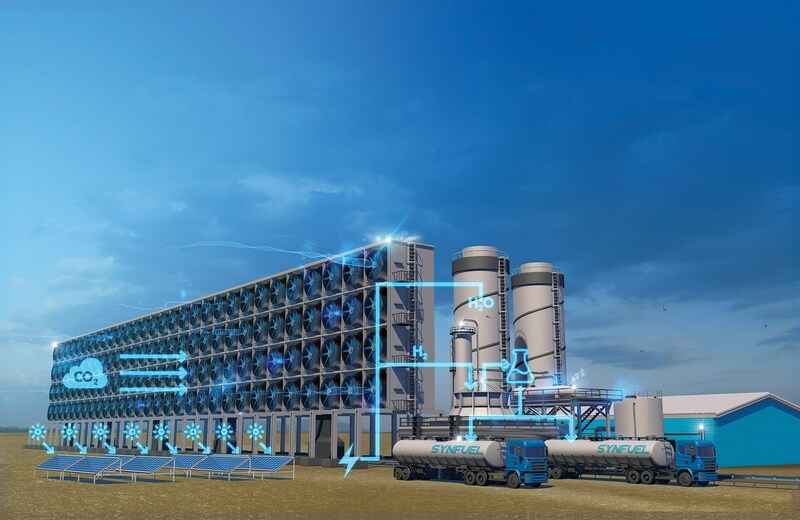 Burning synfuel does release CO2 back into the air, but because it can be recaptured, the process is a closed loop which could help cut the 10 billion tonnes of carbon added to the atmosphere annually. The fuel also produces lower levels of particulates and no sulphur, reducing localised air pollution. Synthetic fuel for cars: could it become a reality? There are a number of research projects being undertaken around the world, with Audi having bought into Switzerland’s Climeworks, while Microsoft billionaire Bill Gates is partially funding Carbon Engineering in Canada, which predicts its synfuel would cost less than 70p a litre once production is scaled up in the next decade. Synfuels could be the product that reduces the burden on electrification to meet the tough targets set by the Paris Climate Agreement, says Dr Oliver Malwald, technology and innovation vice-president at supplier Continental, and there are many ways to capture the carbon, with industrial factories a particular target. ‘It’s easier to capture CO2 from industrial complexes and transform it into an energy source,’ he reckons, and this year sees the start of a €500 million joint EU and German government-funded programme to develop a business case for capturing carbon from industrial smoke stacks, with pilot production starting around 2025. But there’s a second potential method for creating synfuel that’s even more ambitious, using bacteria. Mazda is involved in the development, working with scientists in Tokyo and Hiroshima to produce synfuels which are extracted from laboratory-developed strains of E. coli. ‘These fuels are considered carbon neutral, as the CO2 released when they burn is offset by the CO2 that was absorbed by the micro-organisms that originally formed the bio-fuel, and will be re-absorbed again in the production cycle,’ claims John Love, professor of synthetic biology at Exeter University and a leading bio-fuels expert. Crucially these bug-based synfuels do not impact the food chain, as bioethanol from fermented sugar cane does, and because these fuels are tailor-made, it would also be possible to reduce NOx and particulates or boost octane ratings to increase engine output while minimising emissions. The challenge is industrialising the process: currently only ‘micro-litres’ are being produced, says Love. But a pilot plant could be running by 2025 with commercialisation by mid-century – the same timescale Mazda has for its bio-fuel Skyactiv engines. Governments around the world are talking tough on banning internal combustion-engined cars in a couple of decades. But if synthetic fuels are successfully industrialised, the internal combustion engine could go from being the problem to being part of the solution. Direct Air Capture requires banks of fans, known as contactors, to draw in air from the atmosphere. The air then passes over sheets of corrugated plastic coated in potassium hydroxide to separate out the CO2. A typical installation would capture up to 984,000 tons of CO2 a year, equivalent to the emissions of 250,000 cars. In a separate process, hydrogen is generated by electrolysing water using green energy such as wind or solar power. Deserts are an ideal location for their solar efficiency. The hydrogen and CO2 are then combined in the first of two chemical processes. The first creates syngas, which is reacted again to produce the synthetic fuel. This can be burned in pure form, or blended with conventional fossil fuels, with the CO2 recaptured and lower levels of particulates too. The inhospitable Sahara desert could be an ideal location, given the abundance of sun and air. Bath University’s Jamie Turner estimates that just 770 Saharan square miles could supply Europe’s transportation needs.